I had a customer drop off a laptop with a BIOS password locking the customer out of the BIOS settings. The laptop was an eMachines E527-2537 running Windows 7 x64. Normally, you can reset a BIOS password by removing the CMOS battery, but laptops typically don’t have CMOS batteries to remove, leaving you with having to either send the laptop in for service from the manufacturer, or trying to hack the BIOS password another way. In the past, with AMI/Award/Phoenix BIOSes, there have been tools available to decrypt, reset, or otherwise mangle the BIOS settings into removing the password. Unfortunately, none of those tools work on EFI firmwares, which are the next generation of BIOS. Naturally, this laptop just has to have an Insyde H2O EFI firmware, making the old tools obsolete. To add to the problem, this laptop was unable to boot from a CD because the boot option were hidden in, you guessed it, the password protected BIOS. So. Here’s what I did to get the laptop to boot from a USB stick and reset the bios password. NOTE: This guide is written for tech savvy people who know what they are doing. If you are uncomfortable with the command line, flashing BIOSes or getting your hands dirty, don’t attempt this process yourself. I cannot and will not hold your hand while you do this. I wrote this guide because I didn’t see anything like it online and I wanted to leave it here as a quick guide for other techs. I can’t offer support for this procedure. If you need computer repair in Houston, then please call me and I would be glad to do this for you. This guide will take you through a few steps. We will install a boot loader to get around our inability to select a boot device thanks to the BIOS password. If you can already boot from USB for whatever reason, then skip to step 4 and then to 6. We will then prepare a bootable USB stick and our BIOS flashing batch file. Finally, we’ll boot from the USB stick and flash our BIOS. Since I was still able to boot into Windows 7, I used EasyBCD to install PLoP in the Windows Boot Manager. PLoP is a boot loader which will allow us to boot from other media like CD/DVD, network and USB sticks. If you are on XP or earlier, you can install PLoP via a different method. Google it. 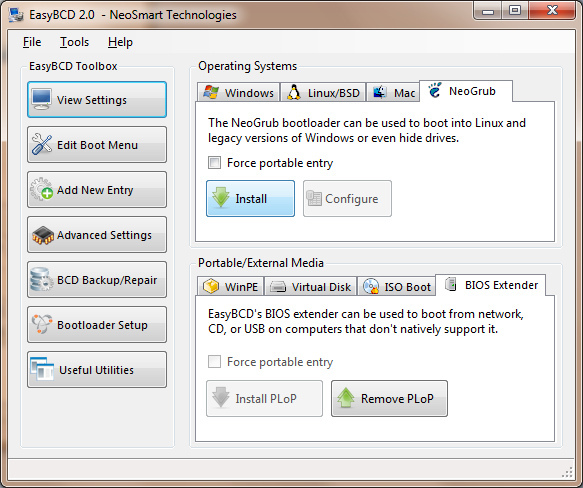 Install EasyBCD and install PLoP as the BIOS Extender, as shown in this image. There are many guides on how to create a USB stick that is bootable into DOS. Here is one that you might like. Go to your computer manufacturer’s website and download the latest version of the BIOS for your computer. It will likely come in two versions, one to flash from Windows and another to flash from DOS. We want the one to flash from DOS. There will be a few files in the archive, one called flashit.exe (the BIOS flashing program), another with a name like pawf5106.fd (your file might be named differently, this is the filename for the laptop I was working on), and a batch file with some parameters set for flashing. Create a folder on your USB stick and place these files in it. The name doesn’t really matter. the C flag will clear the CMOS memory and the FP flag will flash your bios without a password. Without that flag, any bios update will retain the old password. The bios file (PAWF5106.fd) will likely be different for you. Plug your USB stick in and turn the computer on. On the Windows Boot Manager screen, select the BIOS Extender and then select USB from the boot options. From the DOS prompt, navigate to the folder that contains flashit, the BIOS file, and the batch file. Make sure the computer is plugged into AC power and fully charged. Run your edited batch file and wait for the flashing process to finish. Once it is done, it will reboot automatically. Hit F2 as the computer boots to get into setup. Look at that! No password prompt! Congratulations! Now you can tun on the F12 Temporary Boot Menu and change the boot order all you want. I hope this helps you out and saves you some time. Lord knows I wasted plenty of mine. If any parts of this guide are overly vague, leave a comment and I’ll see if I can’t clean it up. I’ve also been up all night working on this laptop, so I might be a little funny. If the DOS folder of the BIOS update doesn’t have a flashit.exe file, then I’m not sure what you would use to flash the new BIOS. I can’t seem to find your model laptop on emachines’ website either, so I can’t check for myself. If you can’t boot from the hard drive, then you’re going to have a tough time reflashing the BIOS, too. If your bios settings already let you boot from a CD, then you should be able to follow my guide without having to install PLoP. As I mentioned in the beginning of the post, though, this is for advanced users only. David I have a Gateway NE56R41 laptop with Insyde H2O EFI BIOS 3.7. The version is 1.13. When I hit F2 I get the password prompt. I dont know what website to go to to find the newer Bios Dos version.I went to the Gateway site and there is no dos version on their site. The good thing is that I can boot up to Windows. If you could find a website for me to download the DOS VERSION of the newerInsyde H2O EFI BIOS 3.7 bios. I will definitely follow your steps. Thank you so much. I had an Acer Aspire that had a bios password and an HDD password. I was lucky enough to guess the HD password but ended up having to flash the bios per your instructions to remove the password. It worked great! Thanks a lot! I have an acer aspire ethos 5943g whith an Insyde H2O EFI BIOS. Would it work on my machine too? You can also download the the windows version of the flasher, open the platform.ini file with notepad . In the ForceFlash section, set Password = 1 . It will force the flasher to reflash the password and thus removing it. Then open the flasher exe file and Flash! I tried it and it worked on my Acer Travelmate. Wow, Very impressive! I was wondering what is the equivalent for BIOS on Lenovo ThinkPad L420 (I believe it’s a Phoenix BIOS)? Wow. That is great news, Hilal. I hadn’t even thought to check that file, I guess I thought it was more like the Dell/HP bios flashers that are all in one executable. I checked the platform.ini file for the BIOS I used on this laptop, and sure enough, it has the password parameter you’re talking about. I’ll have to do another quick write-up since it pretty much invalidates all the multi-booting nonsense I had to go through to do it in DOS. Go here http://support.emachines.com/em/driver/nb/e725.html or anywhere to download the bios. It will be an exe file. So with an unzipping program (like winrar), extract the content. Then you will see the platform.ini. The Insyde H2O EFI BIOS is also found in new HP and Acer laptops. To unlock the Insyde H20 EFI BIOS just supply the 8 digit password key to http://unlockbiosrecovery.com/Unlock_Insyde_Bios.php and for $20 dollars they calculate the Insyde H20 EFI BIOS master password and email it to you. They guarantee it to work or they refund your money. They respond back to your order within a couple hours. I use them a lot as I repair laptops for work. Did you try the trick from Hilal above? It seems like that would work if the DOS method didn’t. Hello, I have a Sony VPC-P111KX with the Bios PassWord. Sony site does not have a Bios update??? so after flashing I was able to get into the bios, this did not take care of the hard drive password though, seems there is no way around that. I believe on some models you have to take the hard drive out when you are preforming the flash for the password clearing to take place then you need to replace the hard drive since there seems to be no way to unlock it that I could find. That’s great news that you could figure it out. I’m afraid there’s not much to do about the hard drive password. That’s an entirely different protection scheme and far beyond the scope of this article at least. I don’t know of any ways to get around a drive password, as those are baked into the firmware. I have a Lenovo G560 that i cant remember the Bios Password, can anyone help me? Just downlod the bios update (exe file). Extract it using winrar or any extracting tool. Open platform.ini. go to [ForceFlash] section. Change Password=0 to Password=1. Save, close file and run InsydeFlash.exe. Worked perfectly for me! Thank you!! Thanks Hilal, I tried that but when i press F2 to go into bios it asks me for a password still. How can I rest the intel ME password on my fujitsu E 780?? I am watching this thread cause I tried the mention method, updated the bios and changes the value for erasing the password and I still get the prompt for password. Is this a hard drive password that I have to get past before I can access the Bios? I get no code on failed attempts to remember the password just System Halted. It was not a HD password still the bios password. Along with changing the settings for password in the platform.ini file, I also changed the setting for ALL-0 to 1. That worked! It still could not have been done without the help provided here. Thank you. PS.. I dont have access to windows on the laptop due to the bootmgr being up that famous creek without a paddle. Is there a way to just fix the bootmgr to get access to the system and do it all from in windows. I dont have CD/DVD or USB booting options available to me and cant access bios to or F12 to change boot order. I have just for your info removed the bios battery for 20 mins /reassembled the laptop and the password is still there… strange but true ……………..
I’ve an Acer D260, still presenting with a Bios password after the trying flashing the bios. I downloaded Bios from Acer, extracting the Insydeflash files with 7-Zip from the windows flash file (NAV70315W.exe). Edited the platform.ini changed ALL=1 and password=1, ran InsydeFlash. The Bios updated but it still has a Bios password. Thanks, man. I’m going to give it a try on my abandoned acer. FYI, there is now an unlock tool to for Insyde H2O BIOS. Dogbert provides his tool (and source code) free of charge under GNU Licensing. people to unlock under payable service.but still my problem is not yet solved.im suffering a lot because my project work is lacking behind. sir im not in a position to pay lots of money for new one . If Hilal’s comment really works, you should add it to your post! Saves ALOT of time then! PLS HELP! My Acer Aspire 5943g laptop got damaged and I replaced it but can’t install windows. I press F2 for setup to reconfigure but its not responding, F12 does not too. I can’t access d bios setup at all. Pls help!! Wat can I do to access setup? I have acer aspire 4738. I forget my bios password. it show just 20 second time enter password.I tried to up proces(made botable pendrive and copy bios file on drive. Made . Bat file , doesn’t work. The procedure that Hilal details above on his post from July 12, 2011 worked for me on an Acer Aspire AS3810T with one change. In the platform.ini file, I changed the Password=0 to Password=1 under ForceFlash but still couldn’t perform the flash because I already had the most current version. I went back into the platform.ini file and changed flag=1 to flag=0 under Bios_Version_Check. I was then able to flash the BIOS and access it at bootup. Thank you all so much! Did you know that Acer wants $99 to fix this? You guys just saved me $99! 9. the bios password for my machine was listed here in plain text towards the end of the scancodes and ascii strings. Note: I changed the password to see if I could find it again and I could but it was listed under the ASCII strings this time , and not both like it had been previously, so you will have to mess around with it to figure it out. Good Luck! Maybe you have observed a virus that infects command prompt? I discovered one last week and had to change the computer registry to get rid of a few entries. It was a rather tough eradication as the entries were concealed very well. If you like I will talk about a few of the things I did to remove this malware. Can this method work on a hp elitebook 8440p? Please help me with my Lenovo G770, maybe there are other variables i could safely change in order to remove the password? Maybe its hiding in other part not touched when updating with default values?.. I think I just avoided bricking my computer by a whisker. Acer Aspire One AOA150 with BIOS password I couldn’t get past. First I tried the method detailed here and I get an error message when I boot to BIOS Extender. First it’s “Remove discs or other media. Press any key to restart.” When I hit a key I get some more text with patent info or whatever and then I’m told there’s no bootable device and to connect one. My USB stick was already bootable, but I did the process again anyway. Same thing. And I’m left with just that message and no command prompt to work with. So then I tried Hilal’s Windows method. It looked like it was working and when I rebooted per the instructions (and selected Windows 7) Windows wouldn’t load and the computer turned off completely. Same thing the second time. The third time at least I got a screen telling me that Windows hadn’t loaded properly and I chose the Repair Windows Start (or something similar) instead of Start Windows Normally. It looked like it was starting and then the computer turned off completely again. After two more tries at attempting to repair I’m now at a screen telling me that Windows was unable to start and asking me if I want to do a system restore. FACK! At least before Windows was functioning perfectly. Now not only have I apparently done a bad BIOS flash but I’ve screwed Windows up in the process (oh yeah, and when I F2 I still get the “enter current password” thing). I think I’m screwed. Any advice gladly appreciated. Thx. OK, so my freak out was slightly premature. Windows 7 now loads properly again, but I’m back to square one on getting past that damn BIOS password. im ajay… im using lenovo G560,BIOS password kept by my friend,and now he forgotten my BIOS password,more over he not even informed that he kept password to my BIOS,now im unable to enter into bios setting ,im getting problems issues like (1)Blue screen error when booting XP or win7 32bit (2 )vmware nt accepting (3) accepts only win7 x64 in my lap.im unable to use other OS… i already concern to lenovo service center ,they flashed my bios but problem not solved they r unable to unlock my superior BIOS password ,please find solution to my problem ..please help me…im very much thank full to u.. I bought a sony vaio VPCZ13V9E that has a problem with the fan ,always working and after 30/40minutes the portable turns off. I had a full install of windows 7 pro all drivers updated, the laptop continues with the same problem, i then went to update bios and got message that bios is uptodate. F2 bios and found out that model,serial number and service tag is diferent from the one on computer. A friend told me that this could be solved by updating the bios but bios is already upto date what can i do? any help would be greatfull. I purchased a Acer Aspire 5733z. The HD was locked, windows has an unknown pw and the bios is locked. I have been able to unlock the hd, and reset the machine to original. I just need to unlock the bios. I put in 3 incorrect pw and I don’t get any hash codes. Do you know a way to unlock this bios. Will the method above work for this machine? I have recently bought a VPC13V9E(H2O), that has an error at start up”ME FW UPDATE FAILURE” in bios serial number, service tag has been changed. I would like to know if there is any way to resolve this fault. Tried updating Bios but already up to date. Page 36- that board has a built in utility that will do it for you-doh!! cant figure out how to put ebcd on usb drive…. cant find any way to boot to dos and flash bios..
when i type in wrong password 3 times it gives me a 16 digit hash code…. I’m sorry if i’m wrong in writting here but I don’t know what to do. I have an Alienware M14x R2 with InsydeH20 A11 bios. And since I have removed the original HDD to put a SSD mSata a password appears. It’s not a password to acces to bios but the one for “Unlock Setup” as it’s write. I can’t modify anything in Bios(read only), and i’m in trouble bacause i can’t change my boot selection. Alienware support can’t help me. I tried to flash bios, remove CMOS, try million password i could find … but noway ..
Maybe someone can help me here ? Hi yo resolve this? Can you point me in the rigth direction? i have the same problem. Hola tengo una notebook Emachines e727 no carga windows, aprieto “f2” y solo que da en please wait , no me deja ingresar al bios. probe sacandole el Disco rigido y la bateria y mantener presionado 30 y + segundos y aun asi enciende pero se que da alli sin iniciar, presinoo f2 y vuelve “please wait” ya nose que hacer.. I have a Sony VIAO VPCW21AG Model PCG – 21212W netbook with a Insyde H2 Bios, I tried your method and it flashed the BIOS but didn’t remove the password, I can’t boot from a USB, it seems alot of people have problems concerning the BIOS especially on Notebooks & Netbooks…..If anyone has the universal password please share. Thank you in advance. Sadly, this did not work for us. F2 Password still in place, BIOS is still locked. We used the same version of BIOS on an Acer Aspire One (AO533) to do the deed, but it did not help, unfortunately. Worse, it now no longer responds to F12 for boot, so we cannot revisit the problem easily. About to try removing the HDD to see if it drops through to USB. Same exact experience as TinyTim. I’ve tried this in Windows and now DOS. No go, and I’ve lost F12 in the doing. Perfect solution! You’re the best! Thank you very much for the guide! David. It works for Gateway Insyde H2O EFI BIOS. Very helpful information particularly the lasxt part 🙂 I care for such information a lot. I wwas looking for this certain info for a long time. Thank you and best of luck. Raj, that is the DOS version. Hers another way, so simple i cant believe it worked. Boot with that dell disc from the link above, write down your service tag EX: 9KKNNN2 and then erase it. It asks for a new one after that — enter it exactly the same. Completely erased the BIOs settings and passwords- even reset computrace. That asset tag disc is also available at dell if the link above becomes invalid. O is off 1 is on, and this is factory reset switch “-factory” not sure if its gonna work in yours. You may need to download an old bios from * mydigitallife.info * or my favorite bios site ** http://www.bios-mods.com/ ** And you really dont want to unlock the ADVANCED features, its creates more trouble than its worth. You can find everything about bios on those 2 sites. Hey, i just found the DELL maintenance disc over there also. I haven’t tested it yet but here is a link. One of those – enter serv tag and it generates password disc. amazed me. Thank you, quite nice post. I have an Acer Aspire 5560 laptop. I believe it has an H2O Insyde BIOS. My son messed it up by adding a password he doesn’t remember. I tried, twice, to type in the password, but no luck. Didn’t want to brick the laptop by trying a 3rd time. At least I can still use the laptop in Windows 7. I can try another two times, if the password attempt counter resets every reboot, but won’t if not. I tried disassembling it and removing the RTC battery, even left it unplugged, no battery, no RTC battery overnight. No good. What tactic can I try? I’m assuming there are some tactics that are unit specific, so I probably need one for my particular Acer Aspire 5560? I would say ground him- take away his phone, video games, ipad until he remembers. Sounds like a sure fire method to me of getting that password. It was his computer (I gave it to him), when he messed with the BIOS. I didn’t think I would be getting it back or using it again. Well, now I am. I’d like to stay away from Windows 8 as long as possible. My other laptop was a Win8 unit and I’m kinda glad to not be using it anymore, especially after Win8.1 came out. By “messed it up”, I mean that it now asks for a password, when it didn’t before. The password he thinks he used, wasn’t it. Maybe it was all caps or maybe all uncapitalized, but I only had two tries, in which to get it and I couldn’t. Why was he creating a password in the BIOS? He says he thought that was how you reset the laptop to factory spec (when he gave it back to me). He’s 15 and just smart enough to think he knows how to do everything and messes things up royally when he’s wrong. I discovered this “password issue” a few days ago, long after I’d installed all my software and set up everything just so. I’d like to keep this laptop, but I’d also like to be able to have it back to not having any password in the BIOS, too. Unless the password attempt counter resets after every reboot, I can’t afford to try again, lest I brick the laptop. I’m not going to do that. I like this computer, functioning. OK , so you pulled the bios battery and shorted out the pins it connects to already. That leaves the same issue. Acer GUI bios tool work? I dont know what its called but its nice little admin program you run from the gui in windows. The HM book says you have jumpers with pins 1&5 being the hot or clear cmos pins. I don’t think there is pins/jumpers on there though. Moving right along, you a few options. Its phoenix bios so a complete recover to factory should be last resort ( http://bios-repair.co.uk/BIOS/Recovery/Phoenix-BIOS-Recovery.html )You can get into your bios from windows- thats a good thing. Did you try all FN key combo’s at boot, or is that why your here. Anyway look over here ( http://forums.mydigitallife.info/threads/2299-Guide-to-remove-BIOS-password-of-Acer-computer-%28Both-Laptop-amp-Desktop%29 ) and then over here ( http://www.cgsecurity.org/wiki/CmosPwd ) and if all else fails use phoenix recover tool to do a complete re-flash to factory. Is there something in there you NEED to change or just bother’s you. It would bother me. Hey guys. I’ve tried the method above and it did not solved the problem, The password still remains and there is no hash code. The guy from the support of the motherboard wanna charge me $100 for the procedure, and according to him the bios needs to be replaced. Is that true? Wish that someone could helpe me. Ramon: Theres 90 messages and about 20 procedures listed here. Could you be a tad more specific. What -where -when -how -why and on what?? Hello Andrew, thanks for your reply. Actually I tried the windows version of the tutorial, modifying the plataform.ini with all parameters listed: PASSWORD=1, CLEARCMOS=1 and it did not worked. I tried the crisis recovery too, put the bios file in the usb flash drive and then started the recovery. Unfortunately it does not reset the password. I contacted the manufacture of my motherboard and then charged me $90 for the replacement of bios. I am afraid that they are charging this amount for proceed with a simple step. VT on or VTD on– HT-multi cores disabled. Webcam/Btooth/network boot…. or security features OFF when you want them on. What’s the PC- lets start there. And have you checked for a modded bios. My pc is a Avell B-154 a barebone of Compal QAL51. It’s a descent notebook and I really like it. Well, let me see if I understood… You suggested to reflash the bios with the values set to “0”? Do u know where can I find the previous bios? different computer manufactures an QAL don’t support anything its all OEM. They have an FTP server but its empty ?? Look these links over. Thanks for your reply. I attempted the crisis recovery, but the procedure did not overwrite the password. The bios used for the flashing was this http://www.4shared.com/zip/W1DXBX-z/BIOS_V640.html? and the one for the crysis recovery is an older version. Do you need it? Thats a 655D he is doing it on, the letters usually stand for either where you bought it (D is office Max/depot or online??) or they differentiate between Intel/AMD models also. Its the same both ways. Don’t forget to pull the HD first and try the F9. Below at the bottom is from your manual. Now having said that, there is a built in factory repair section called (boot block? i think) in your bios. Thats what you need to flash to. How you get back there is BAD BAD advice from my methods. DONT DO THIS, but this is what i would do. crash your flash in the process- unplug it-corrupt it-make it unbootable. Then start from scratch. Now most normal people would just dump the bios and use “Universal BIOS Backup ToolKit 2.0” or some other bios backup tool and extract the QALXX610.bin and flash from that after a rename it. Your manual also shows a jumper but i don’t have a board to look at other than eBay pictures. diskette, the system can perform crisis recovery by using internal PS2 keyboard. Plug in the USB floppy drive with crisis floppy diskette inserted. Hold down Fn + B keys. Plug in AC adapter and make sure it is powered. So you are saying that I have to start a crysis recovery and then make it corrupted? After all try the crysis recovery again and it will erase the password? Hi david! I know i’m a bit late for replying this, but i hope you are there. I have Acer v3-771G laptop with Insyde v2.28 bios update. I really need to reset my bios password and i’m just a novice doing geeks work. Could you please help me with this process? I’m sorry, but as I mentioned in the note at the top of this post, I can’t help you or anyone else who isn’t in Houston with their BIOS issue. This post is over 3 years old, I don’t even know if the methods I’ve described will work on newer laptops and BIOSes. Best of luck. Used the DOS method from 124 to 124 … didn’t work (on Acer Aspire 1830). Kept at it until I found a method that works. 2.) Had to download older version of the BIOS (b/c I was already on the latest). Also, I’m not sure if a lockout timer was preventing me from getting it working either. 4.) After reboot, hit F2, it worked!!! 6.) Used gparted to clear the HDD and reformat with OS (lost any HDD data). Yes, I confirmed John’s method on my Acer Aspire 1830 laptop. The changes need to be entered in the BIOS.bat file. The above entries are already set. No changes needed. As John showed in his post. Run the flash.bat file. Once the the latop reboots press F2 to enter the BIOS utility. Now you can re-flash the BIOS to a newer version. Thank you for posting, John. my insyideh20 has blocked,, please help me…. David – thanks! I’m finally installing Windows 10 on my Travelmate 8371 via a USB stick… I’d forgotten my BIOS password years ago. I ended up using Hilal’s Windows method from July 12th 2011 – I also had to change the flag which checks whether the BIOS version is the same or older, so that it didn’t close down the flash program when it detected that I was reinstalling the same version. Thanks again for your comprehensive explanations. So far I’m not having much luck on my 4320s. Tried a number of methods including one supplied by HP and it didn’t work. I can boot and use the laptop ok but I need to flash to the latest BIOS and hope that it works with the 8Gb RAM I bought for it as it will not take either 4Gb stick at all right now. Works fine with the 3Gb I had spare. I can get into BIOS (UEFI seems more accurate) and change all but security settings. Any suggestions anyone? Anyone who has this HP model ever been able to clear the administrator password?